Rev. 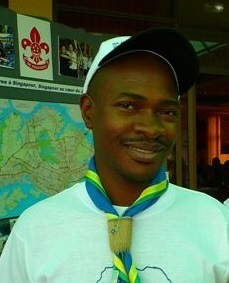 Tebogo Rakgabyane was recently appointed chairman of the new Scouting position “Growth, Inclusivity and Diversity”. We spoke to Reverend Tebogo about his life, his Scouting journey and what he will strive to achieve in his new position. Rev Tebogo hails from Springs in Gauteng. He joined the Scouting Movement as a Cub in 1982 whilst attending Primary School in the Kwa-Thema community. “I’ve always loved trying new things and I was very adventurous as a child. Since there wasn’t much to do at the time, joining Scouting was an opportunity for me to get out, and definitely not stay at home”, he says with a smile. Whilst in High School Rev Tebogo took over the leadership of the 2nd Kwa-Thema Troop. “When I was 14 I had to take over as Troop Leader and Junior Scoutmaster as there were no adult leaders and Senior Scouts in our Troop with the zeal to continue. I grew our Troop from only 6 Scouts to 37 Scouts. Shortly afterwards Mr. Mkhonza, a former school teacher and Group Scouter from a neighboring Scout Group, invited us to join and we merged the two Groups. He was a great mentor who afforded me the opportunity to run the Troop, guiding me here and there. The Group grew from 54 to over 160 members and there was a good balance of Cubs, Scouts and Patrol Leaders. 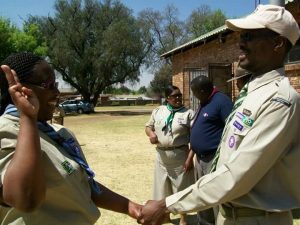 Scouting was a buzz word in Kwa-Thema at the time!” During this period Rev Tebogo completed the Patrol Leadership Course and met one of the longest serving District Commissioners, Mrs. Mirriam Tsagaane, who also took him under her wing. “She mentored me, disciplined me, trained me, and opened up opportunities for me to grow within the Scout Movement. At the age of 15 I did my PLTU course, then became Junior Troop Scouter for 9th Kwa-Thema, then Assistant Troop Scouter for 1st Kwa-Thema and in 1994 I returned to revive the 2nd Kwa-Thema, but this time as the New Age Scout Troop where I was Troop Scouter. 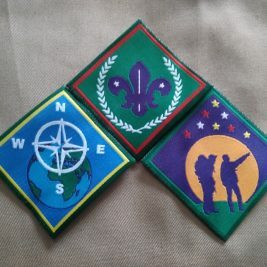 In 2000 we changed the name from New Age Scout Troop to Unified Scout Group, and I became its Group Scouter. Currently I’m their Acting Scout Group Leader”, he explains. In addition to his activities with his Scout Group, Rev Tebogo also participated at the 1st Southern African Scout-Youth Forum, which was held in Pretoria in 1997, and then became part of the Organising Committee for the 7th World Scout-Youth Forum, which was held in Durban in 1999. “In 2000, together with the then Chief Scout, Mr. Nkwenkwe Nkomo, I attended the 4th Southern African Zonal Youth Forum & 32nd Southern African Zonal Conference in Mbabane Swaziland, and I was appointed in the Committee, responsible for Training & Development. Throughout my youthful years as a Scout, I was forever known as a go-getter, and someone who always had his eye on the bigger picture. It’s still the same even today”, he says. After he matriculated Rev Tebogo took a gap year to pursue his love for Scouting and community work. He then went on to achieve a number of diploma’s including Management Development and Public Relations. He received certificates in Marketing and Project Management and completed the Bible Course at Rhema Life Bible College and the Prophetic Ministry Course at Sanctuary of Hope Bible College (School of Prophets). He has also received numerous national and international awards and nominations including the Bronze Gold Shield Award(now known as the President Award) in 1989 where he became the very 1st Scout in SA to get the award. He was also the 1st South African Scout to be awarded with the Regional Scout Association’s Top Achiever Scouts (ATAS Award) at the 33rd Africa Regional Scout Conference in Kigali Ruanda in 2006. In 2013 he was conferred with an Honorary Doctorate in Divinity, by the New World Mission Dunamis International University. 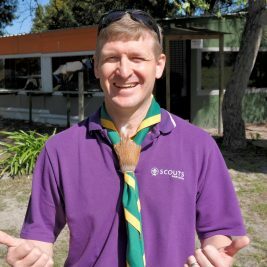 “In the 36 years of my Scouting life, there’s only one Challenge Award I still want to pursue, and I won’t rest until I have achieved it – my Scouts Wings. I could have done this when I was a young Scout, but you know, money issues and stuff…lol”, he quips. Throughout his professional life Rev Tebogo has founded and led a number of Non Profit Companies, Trusts and businesses. He also served as Chairman of the South African Minister’s Network for 2 years. Rev Tebogo has also had his fair share in the political sphere in SA having been active from 1990 till 2013. In more recent years he founded, and currently still chairs, the Unemployed People’s Co-operative Federation of SA (UPCF-SA) and is focused on growing his international commodity trading company SEFIKA Holdings cc. Rev Tebogo has served in numerous roles in Scouting and has been instrumental in the transformation and growth of the Movement, mostly in Gauteng where he held the position of Assistant Provincial Commissioner: Transformation & Development and worked extensively with Scout Groups in underdeveloped communities. “I feel very honored, and challenged at the same time to be entrusted with this new position as National Chair: Growth, Inclusivity and Diversity”, he says. “South Africa as a nation is currently going through some challenging times politically, socially, and economically. The Scout Movement is being challenged to really show what we’re made off, by showing our numbers. For SSA to attract more funding, and forge through good and beneficial partnerships with relevant stakeholders, we must show the numbers, especially since we are one of the oldest youth movements in the country. Scouting doesn’t exist in a vacuum, and certainly doesn’t act alone! It has many partnerships. However, in order to grow, we must find out which churches, youth clubs, schools and other organisations with similar or complementary goals to Scouting are willing to establish new partnerships and be associates in our recruitment campaigns. I want to try and reach 500 000 members for SSA by the time I vacate this Office, with an understanding that, 18 months is rather a short period, but one can only try, and maybe we can achieve this, if we work together as a team. I would also love to see more females in positions of seniority. We also need to find a way to support those from the disadvantaged areas to come into the fold even though they can’t always afford to make it to meetings. They can contribute significantly in changing and growing SCOUTS SA”, he concludes.